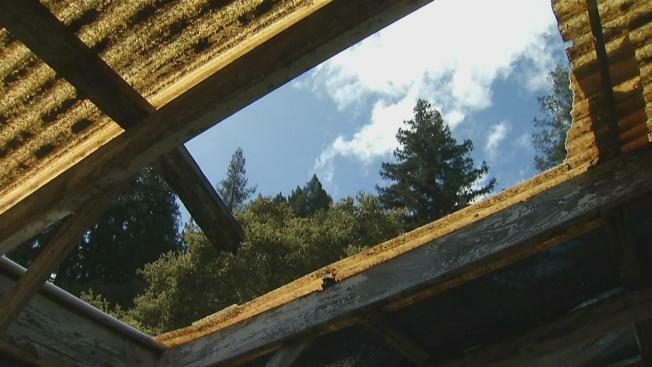 The latest rain and wind delivered another blow to communities in the Santa Cruz Mountains on Tuesday morning, and there are serious concerns as the area braces for heavier rain later this week. Communities along the San Lorenzo River are dreading the next few days as the flow of water picked up Tuesday, prompting worries that the river could overflow again. Many residents are saying the storms this week won't give them enough time to recover or prepare. "They just keep coming in a series, one after another, so it's really difficult to get back in the groove," said Tom Connelly, owner of The Plant Works. Connelly has been a business owner in Ben Lomond for 37-years, and the past few weeks, including Tuesday's storm, had him worried how much longer he'd be in business. "This is part of the roof that blew off the greenhouse," he said, showing some of the recent damage done. Throughout the area, crews were frantically trying to stay in front of the storm. The area's emergency center at Valley Churches United said the wind and rain have been a brutal combination. "I think the wind worries a lot of us because we know how many trees have come down," said Lynn Robinson, executive director of Valley Churches United. "A lot of residential properties have had problems with trees in and of themselves. But also there are so many people that said this year Water came from all different directions." The area got a break for most Tuesday afternoon, but it won't be long before residents are bracing again for another heavy storm expected Friday.